Kno, a Santa Clara, Calif.-based startup that plans to launch a two-screen “digital textbook” later this year, today announced that it has raised a $46-million financing round led by Andreessen Horowitz, with Silicon Valley Bank and TriplePoint Capital also participating in the debt and equity funding. The latest cash infusion brings the total raised by the company to $55 million, which the company says should provide enough resources to get its tablet to market by the end of this year. This is Kno founder Osman Rashid’s second crack at revolutionizing the textbook market: He’s also the founder and former CEO of Chegg, a startup that rents access to university textbooks. Kno is a much more ambitious project, however, since it involves launching a new hardware device and a software platform at the same time. 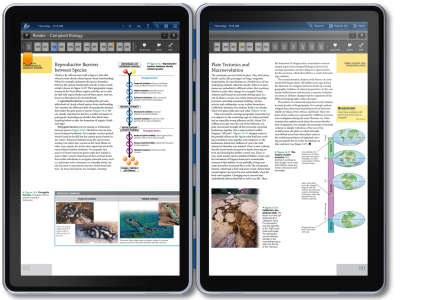 The Kno — which runs a version of Linux and uses the Chrome (s goog) browser as its interface — is designed to replicate the printed textbook, but also allows users to write notes on the screen and search through the text. The company has a beta trial underway with several textbook publishers, including McGraw-Hill (s mhp) and Wiley (s jw-a). Kno isn’t the only company who wants to use a tablet to revolutionize the textbook business: A startup called Inkling is also going after that prize, but it’s using the iPad (s aapl) as a platform, rather than building a dedicated device. The company recently launched its software, which allows for a wide range of interactivity within a digital textbook, including 3-D spinning molecules that can be rotated in any direction. Inkling has also been funded by a group of venture capital firms — including Sequoia Capital, Sherpalo Ventures and former Google staffer Aydin Senkut’s Felicis Ventures — although the size of the funding round hasn’t been released. Until the Kno hits the market, it’s difficult to say whether it will get widespread adoption by students (or parents). The company hasn’t said exactly how much the device will cost, but has estimated that it will be under $1,000, which could be a hefty price tag for some. It’s also not clear how much the company’s digital textbooks will cost, or whether they will be bundled with the device. Plus, the two-panel tablet looks fairly bulky, which could be an issue as well. Inkling’s solution is somewhat less expensive, since it’s based on the cheaper (and lighter) iPad, which some students may already own or be thinking of buying. Steve and his mighty iPad will summarily CRUSH this goofy eTextbook. iPad envy is everywhere. iPad could sell somewhere between 30 and 50 MILLION units next year. Boom. I’m glad to see that they’re getting the funding they need. The Kno will probably be the closest to the Courier I’ll ever get. But as I keep saying, 14″ is too large for a tablet, doubly so for a booklet like the Kno. I have to put up with some small desks in certain classes that can only just manage to fit my E-295C, a sheet of paper, or a textbook. Anything else goes on my lap. Then again, I have five too many textbooks for my five classes, two of which are huge hardcover ones. Even the Kno in that state would likely be much more portable. I think they could get away with something a bit smaller, around 12″ for each screen, if they keep the resolution high enough and allow for zoom and pan. Part of the benefit of going paperless like that is that digital displays aren’t static. If you want a Courier, buy 2 iPads. It’s not hard to figure out. The iPad gets a lot right (screen and battery life in particular), but the lack of an EMR pen digitizer ala Wacom or N-Trig kills its use case for me. Try as they might with a capacitive stylus and palm rejection mechanisms, it just doesn’t work as well for me as a dual digitizer device-something I can only currently get out of traditional Tablet PCs. Pen comes into range, touch gets shut off for perfect palm rejection, pen also supplies a hovering cursor and pressure-sensitive input. The Kno seems like one of the first non-Windows Tablet PC systems to offer a dual digitizer approach and take digital inking seriously. I like that. I’m just not sure if it’ll work at that size. And don’t even think of bringing up pen-and-paper note taking. After having used OneNote on a Wacom Penabled Tablet PC, I cannot go back. It’s far more efficient for the way I work. If you think about it, the energy consumption of this device is ridiculous. If it’s meant to be like a textbook, you can’t really read the two screens at the same time so you’re always wasting battery power on either one of the screens. Yeah, it is a crazy device. There’s just no way they compete with iPad. When you see someone holding one of these beasts, they literally look like Digital Moses. They are giant planks with almost no software on them. If you want to be productive today, whether at work or in school, you get a MacBook and an iPad and you drink everyone else’s milkshake. End of story.